The Toyota 22RE was one of the final engines from the long history of Toyota R family engines. The 4 cylinder 2.4 liter engine manufactured by Toyota was well-known and documented for its reliability. The majority of the applications that this engine was used in were not for North America. In North America, the most common uses of this engine were in the Toyota pickup truck from 1984 until 1995 and in the Toyota 4Runner from 1985 until 1995. In addition to being used in these applications, the engine was also placed in the Toyota Hilux, Celica, and Corona, in addition to the Volkswagen Taro, which was essentially a re-badged Toyota Hilux. The Toyota 22R family consisted of the 22R, 22RE, and 22R-TE. The 22R was first available in 1981 with the 22RE becoming available in 1983. The 22RE was very similar to the 22R engine, but the E denoted the addition of electronic fuel injection (EFI). One major change that occurred on the 22R when the 22RE was introduced was that both engines switched from having a dual-row timing chain to having a single-row timing chain. In 1985 the engines had another major overhaul, with essentially all major parts being changed in one way or another. The post 1985 engine version was then in production for quite some time. The engine was available until 1995 in the Toyota Hilux, pick and 4Runner, while the engine remained available 2 more years until 1997 in the Volkswagen Taro. This is an engine that is still well known for its durability. Many that drove this engine say that it was the best Toyota every built, despite the fact that it was not an overpowering engine. The 22RE as it was originally released had a max power rating of 105 horsepower at 4800 RPM and a peak torque of 137 lb-ft at 2800 RPM. This was the case until the already mentioned major change in 1985. In 1985 the max horsepower increased to 114 at the same engine speed while the peak torque was 140 lb-ft at 3600 RPM. The engine is 2.366 liters, or 144.4 cubic inches, so this power to weight ratio is not particularly great, but as mentioned before, this engine was more known for its great durability. The cylinder bore was measured at 3.62 inches with a stroke of 3.5 inches. The original 22RE was a cast iron engine. Another feature of this engine that helped with the durability was the use of soft piston rings. This allowed the cylinder bores to avoid ridges throughout the life of the engine. The valvetrain on this engine used a conventional push rod setup with the camshaft in the block. The 4 cylinder engine had 1 intake and 1 exhaust valve per cylinder, for a total of 8 valves. 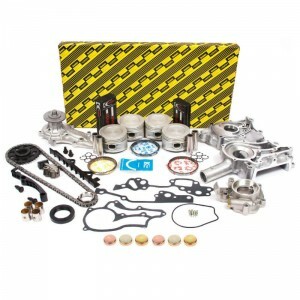 The Toyota 22RE provides the most important thing that people want out of their engine, reliability. People don’t have time to be dealing with engine issues and want a car that gets them from point A to point B reliably and consistently. Although the engine was phased out in 1997, it is likely that many of these engines are still on the road as there are reports of this engine reaching 300k-400k miles, with some reports of an engine reaching 1 million miles. Although the engine has limited amount of power, with the most ever seen coming in at 114 horsepower, these durability numbers helped to build a quality name for Toyota that is still alive to this day. 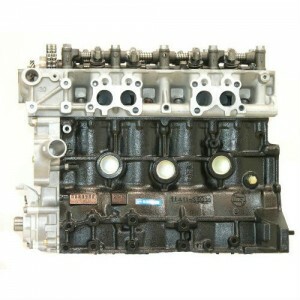 TOYOTA 22R 22RE REMANUFACTURED ENGINE LONG BLOCK ON SALE!!! TOYOTA 22R 22RE REMANUFACTURED ENGINE LONG BLOCK ON SALE NOW!! !